The Patrimony line encapsulates Vacheron Constantin’s very DNA, its heritage and its savoir-faire, patiently accumulated for over 250 years. 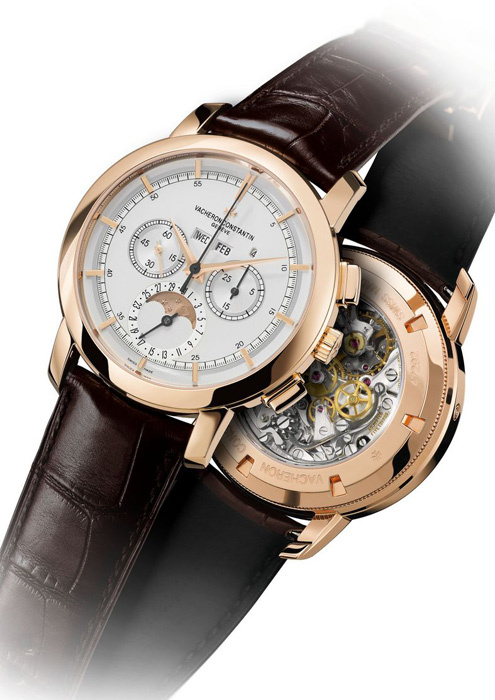 It is also a symbol of the purest kind of elegance, a recognized and longstanding signature of Vacheron Constantin. With its round cases and timeless classicism, the Patrimony is rooted in the purest tradition of watchmaking. 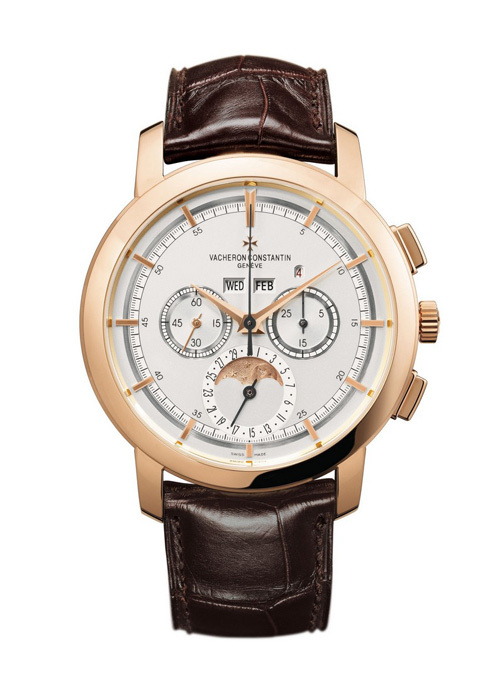 The Traditionnelle line of the Patrimony collection, which was introduced in 2007, is inspired by the aesthetic features that have distinguished some of Vacheron Constantin’s most beautiful historical models. Stamped with purism and rigor, it also adheres to those fundamental values which are important for true connoisseurs and which distinguish the Geneva Manufacture’s most exclusive pieces. A fine bezel, knurling around the screw-down sapphire crystal back, faceted trapezoid hourmarkers, dauphine hands and dials in several historically-inspired shades of silver, and a tiered case and horns with pure, straight lines. These identifying characteristics of the Patrimony Traditionnelle line, expressed in a contemporary style, remind us that tradition and modernity are natural bedfellows at Vacheron Constantin. All the new models in the Patrimony Traditionnelle line meet these clearly defined characteristics. As a result, this prestige line can house a mechanical movement that features a small seconds as well as a major complication. The Manufacture’s engineers, designers and master watchmakers use this line as a vehicle to express the very best of the Vacheron Constantin tradition. A new example of this dynamic is offered with this year’s launching of some new exceptional timepieces in the Patrimony Traditionnelle line, timepieces that express Vacheron Constantin’s savoir-faire and its commitment to the patient construction of a reference line. The Patrimony Traditionnelle line is offering some extraordinary new major pieces in 2009: from a new exclusive manual-winding movement to the most emblematic of chronographs to skeleton and jewelery models. Haute Horlogerie has those emblematic models that attract attention from collectors and arouse the curiosity of genuine watch lovers. Only a handful of renowned chronographs, however, from among the most prestigious, belong to this rare and exclusive club. Particularly admired are the architecture of their movements and the simplicity of their dials. The two new chronographs offered by Vacheron Constantin in its Patrimony Traditionnelle collection belong to this prestigious tradition and will certainly become iconic models of the Geneva Manufacture. They are to Haute Horlogerie what a sublime wine is to oenology. Rare, exclusive and subtle, perfectly conceived and bewitching, they only deliver their true secrets to passionate connoisseurs. This subtle alchemy reveals the truly exceptional nature of the Patrimony Traditionnelle’s new chronographs and perpetual calendar chronographs. At the heart of these two horological jewels is the legendary Vacheron Constantin 1141 calibre, a manual-winding mechanical column-wheel chronograph movement. This outstanding movement has been used to power some of the most prestigious chronographs in the history of watchmaking and is considered by many experts to be the most beautifully made chronograph movement of them all. The exterior of this timepiece is as exceptional as the movement it houses. In keeping with the Patrimony Traditionnelle line, the 18K pink gold case is elegant, simple and classic. The generously-sized 43 mm case guarantees excellent legibility of all the indications on the dial. As well as snailed counters and a painted black minute-track, the silvered opaline dial presents a multi-toned finish in the spirit of Vacheron Constantin’s historic chronographs. The watch enthusiast will immediately pick out affiliations with the chronographs of the 1940’s. The mechanical manual-winding 1141 QP movement makes 18,000 vibrations per hour and has a 48-hour power reserve. Besides the hours, minutes and small seconds at 9 o’clock, it features chronograph functions with a centre direct-drive seconds hand and a 30-minute counter at 3 o’clock. The perpetual calendar indicates the days of the week, months and leap years in windows, as well as the astronomical phases of the moon and a date hand at 6 o’clock. The moon, sometimes happy, sometimes melancholy, is hand-engraved from a gold plate. Like all Vacheron Constantin movements, the 1141 QP calibre is distinguished by the meticulous chamfering work of the Côtes de Genève bridges and the circular-graining of the plate, both done by hand. Water-resistant to a pressure of 3 Bar, the equivalent of 30 metres, the 18K pink gold case features a sapphire crystal back through which one can admire the remarkable complexity and exceptional architecture of the 1141 QP movement. All the aesthetic characteristics of the Patrimony Traditionnelle line – the fine bezel, the knurling around the sapphire crystal back, the dauphine hands, and the dials in several historically-inspired shades of silver – are present and correct in this new Haute Horlogerie chronograph. Although only recently launched, it has already become a benchmark of the genre with collectors. In short, it is endowed with very strong aesthetic and technical arguments. Watch enthusiasts will have realised already that everything about this contemporary timepiece is a tribute to the best of the watchmaking tradition. 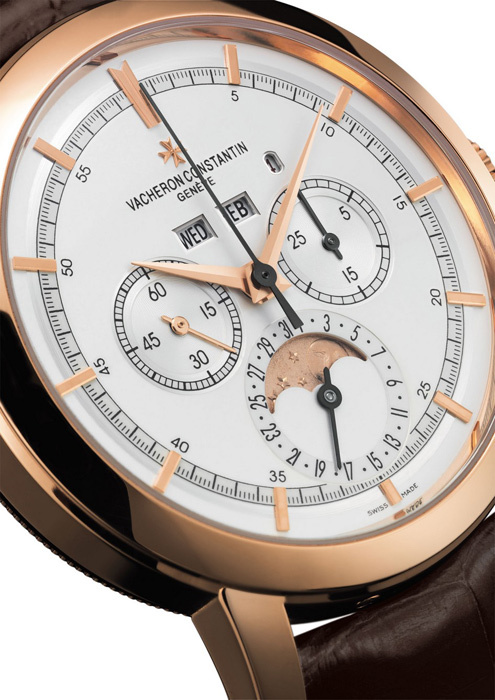 For a start, there is the legendary 1141 calibre column-wheel chronograph, a movement that has become so famous that it has joined the ranks of Vacheron Constantin classics. Recognised by all the experts as one of the most technically and aesthetically accomplished movements and equipped with a magnificent balance reminiscent of the 1940’s, the manual-winding 1141 calibre is reserved for exceptional models. This valuable addition to the Patrimony Traditionnelle line has been housed in the collection’s characteristically classic case, unpretentious and extremely elegant. Another distinguishing feature of this new Vacheron Constantin chronograph is its silvered opaline dial with two counters characteristic of the 1940’s, the chronograph’s golden age. The 30-minute chronograph counter at 3 o’clock and the small seconds at 9 o’clock give the dial perfect balance. The Manufacture’s designers have taken full advantage of the case’s impressive 42-mm diameter to guarantee optimum legibility of all the indications, including the tachometer scale on the dial rim. The 18K pink gold case has been tested for water-resistance to a pressure of 3 Bar, the equivalent of 30 metres. Like the other models in this line, it has a sapphire crystal back through which one can admire the unique and characteristic geometry of the manual-winding 1141 chronograph movement and its exemplary finishing. The 1141 also has a 48-hour power reserve. A tribute to the timepieces made by the Manufacture from the 1930’s to the 1950’s, the new 38 mm Patrimony Traditionnelle is part of a true horological tradition. Its pure lines and harmonious proportions are a strong assertion of its classic character. With its fine bezel, knurled case middle, screw-down sapphire crystal back, faceted trapezoid hourmarkers, dauphine hands and multi-toned dial, this new model sublimates the identifying aesthetic features of the Patrimony Traditionnelle line. At the heart of its case lies Vacheron Constantin’s new manual-winding 4400 calibre, designed and manufactured by the brand’s Research & Development Department in the Joux Valley. Thanks to its impressive barrel, this new movement has a power reserve of approximately 65 hours. It displays the hours and minutes as well as a small seconds at 6 o’clock. And in addition to Vacheron Constantin’s exceptional finishing – always discreet and simple in appearance – the 4400 calibre is stamped with the prestigious Hallmark of Geneva. Conceived in the purest Haute Horlogerie tradition but developed with today’s cutting-edge technology, the new manual-winding 4400 calibre is distinguished by its 12.5’’’ (28.50 mm) diameter, a size specially designed for contemporary cases. 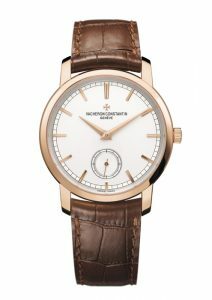 Vacheron Constantin’s designers and watchmakers used this dimension to create the perfect combination of technique and aesthetics. Complying with the twelve criteria required for the Hallmark of Geneva, this new movement meets the even higher demands of decoration and finishing. True to the Vacheron Constantin tradition, all the surfaces of the plate, bridges and other major components are hand-decorated, including those that are not visible. Such quality hand-finishing is an integral part of Vacheron Constantin’s philosophy and distinguishes all its movements. A contemporary testimony to the most authentic watchmaking tradition, this new Patrimony Traditionnelle timepiece comes in a 38-mm 18K pink gold case. The manual-winding movement and its finishing can be admired through the sapphire crystal caseback. Thanks to both its technical and aesthetic qualities, the 38 mm Patrimony Traditionnelle is already on its way to becoming a benchmark in the world of classic Haute Horlogerie and a must for connoisseurs. The Vacheron Constantin Manufacture has made full use of these skills in the new skeleton models being added to the Patrimony Traditionnelle line in 2009. These come in two sizes – 38 mm and 30 mm – and with two different movements offered in diamond-set or plain versions. When the best of Haute Horlogerie marries the best of Haute Joaillerie, exceptional timepieces are the natural offspring. 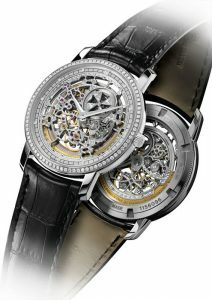 So it is with the Geneva Manufacture’s new sparkling additions to the Patrimony Traditionnelle line. Offered in two different versions – 38 mm and 30 mm – these new diamond-paved jewellery pieces respect the principal aesthetic features of the Patrimony Traditionnelle line. With their remarkable jewellery-setting and impressive lines, these exceptional pieces open up new horizons in the world of precious Haute Horlogerie. 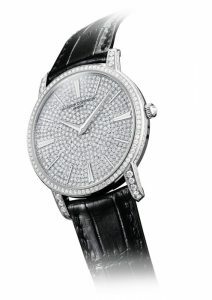 Set with 473 diamonds (totalling 1.67 carats) on the dial and 167 diamonds (totalling 1.27 carats) on the 18K white gold case, as well as a diamond on the crown, the larger version houses Vacheron Constantin’s 1400 calibre, a manual-winding mechanical movement stamped with the prestigious Hallmark of Geneva. One shimmering diamond-paved version, with 264 diamonds (totalling 0.92 carats) on the dial and 131 diamonds (totalling 0.79 carats) on the 18K white gold case. Two more lightly-set versions, with 24 diamonds (totalling 0.04 carats) on the hourmarkers and 64 diamonds (totalling 0.42 carats) on the bezel, and an 18K white or pink gold case.